As the skies look dark and grey and students spend more and more time indoors, it’s beneficial to spend some time decorating your classroom in the winter. The coming holidays can provide you with inspiration. Here are some of the top holiday classroom decorating ideas for your consideration. Have each student paint and decorate a paper plate. Then, attach them to a wall in the shape of a tree. Make several chains out of green construction paper. Attach the top of each one to the wall. 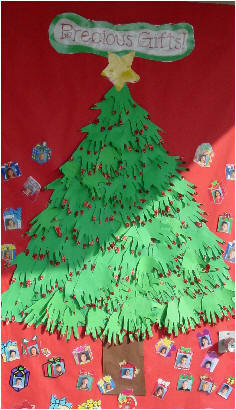 Trace each student’s hands on green construction paper and cut them out. Place the hands in a shape of a tree on the wall. Make a tree out of construction paper. Then, have students create ornaments to hang on the tree. Oh, the weather outside is frightful, so why not have a nice fireplace in your classroom? Create one out of butcher paper. Then, have students decorate stockings to hang on the “mantle.” Your fireplace could be the perfect addition to your reading corner. Who doesn’t want to curl up in front of a fire and read on a snowy day? Wreaths are common décor in homes in the winter. Why not use them in your classroom? Each student could make their own wreath out of paper or a paper plate by cutting a circle out of the middle of it. Then, have students paint it green and add red dots for holly berries. I remember making gingerbread houses in elementary school. We covered empty milk cartons with graham crackers and decorated them with candy. Gingerbread houses continue to be part of my holiday traditions. To bring this idea to your classroom, decorate your door to look like the entrance to a gingerbread house. Use butcher paper, and have students create candies to decorate around the door. If you want to stay away from decorations commonly associated with Christmas, have your students create snowflakes. Give each student a piece of white paper. Teach them how to fold and cut the paper to create snowflakes. Then, hang the snowflakes from the ceiling to create your own winter wonderland. Then, students can help you design the snowmen with eyes, buttons, carrots, etc. Of course, these items could also be made of paper or whatever things you have around your classroom. As you look for ways to decorate your classroom this winter, it’s important to choose a theme that won’t alienate members of your classroom. If you choose to decorate the room with Christmas décor, it would be nice to add Hanukkah and Kwanza decorations, too. This could be a great way to teach the classroom about the different holidays and traditions involved with them. Then, let the creative juices flow to brighten your classroom with these top classroom decorating ideas for the holidays.